It is a source of some pride for many of my winocerous friends (and yours too, I’m sure) that wine bottles are always emptied by bed-time. But if that’s not always possible, what’s the best way of keeping the remainder in top condition? A lot has been written about this, but I disagree with quite a lot of it, and some of the methods I employ don’t seem to get much airtime – so here goes. If you’re sure to finish the bottle the next day, bung it in the fridge. No room or too many bottles? Put them on the back step in the cool night air (dependable in the UK). If you want to eek it out for a few days, I find that Private Preserve or one of its peers is a good solution. 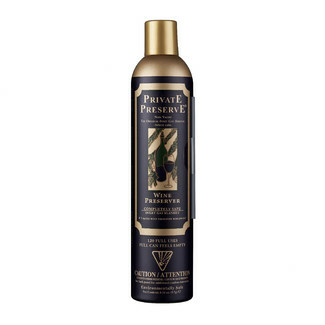 Private Preserve is inert gas in an aerosol can. Squirt for 1-2 seconds into the bottle then replace the cork and gently put it in the fridge (but not the fridge door as it will get shaken up). 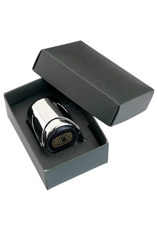 The gas settles on the surface of the wine and seals it off from the air, reducing further oxidation. 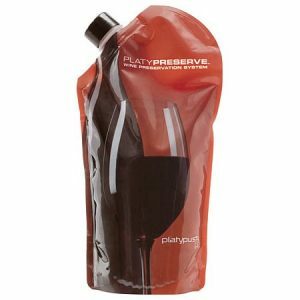 An alternative, and one that will keep wine for as much as a couple of weeks, is PlatyPreserve. This is a plastic pouch like the ones hikers and cyclists use with a drinking tube, but specifically designed for wine. The plastic is ruby red to keep out the light, and doesn’t impart any flavour taint that I can detect. You pour in the remaining wine, then squash it up until it’s brim-full and replace the screw cap. No air space: little oxidation. I use these a lot as we are a small household and I like to have a few different wines on the go at any one time. Then there’s fizz. You need a proper stopper for this – my favourite is by Berry Bros & Rudd. Then it goes in the fridge – and this time the fridge door is a good idea to shake it up occasionally! The other great thing about this is that fizz makes it own inert gas i.e. CO2. It’s amazing how long this keeps bubbly fresh and sparkling – you get an authentic pop each time you remove it just like opening the bottle. There’s one last method which I don’t often use as it involves a lot of messing about, but which is occasionally useful. Let’s say I’m opening a bottle of sweet wine or fortified wine at the end of the meal, with cheese, dessert or chocolate as appropriate. Most people don’t want more than a modest glass and I certainly don’t want to finish it the next day. If there’s at least half a bottle left I will decant what I can into a clean, empty half bottle, add a squirt of Private Preserve and drive in a fresh cork (home brewing shops sells corks and corking tools, though you could use a simple cork stopper instead of course). Then I slap on a label with the name and date and that goes back in the wine fridge. This will keep happily for a few months. I hope this is useful on occasion, but not too often! Disclaimer: I am not connected with any of these companies, and there are alternative brands to each.